Jaipur can disappoint at first glance. The obligatory first stop on tours of North India's so-called Golden Triangle  and the entry point to Rajasthan's legendary desert  is swathed in dust and modernization's haphazard sprawl. It's easy to lose sight of an Old City created by farsighted 18th century maharajas as the country's first urban grid. And the facades of this so-called Pink City (it was painted as such for a British royal visit) are less reminiscent of cupcake frosting than of baked salmon. Yet even the laziest of explorers will soon discover enough curiosities to last a lifetime, let alone three days, two nights. One brand-new attraction is well worth the trip all on its own. Lovingly restored over six years by a local investment group, after two centuries in ruins, the Jal Mahal (Water Palace) is now open for boat trips to its romantic gardens. These are set atop a vision in marble amid a revived lake studded with islets for migratory birds. Master craftsmen, with skills passed down since the time of the first maharajas, were given free rein to paint, carve and gild the palace's viewing walkways  hopefully a harbinger of future preservation projects harkening back to Jaipur's enlightened origins. Here are five other Jaipur essentials. Even the Jal Mahal's perfect love pavilion is only a pit stop on the way to the Amber Fort, a massive set of fortifications best reached by elephant ride. Not enough thrilling battlements for you? Nearby Nahagarh and Jaigarh Forts are mini  Great Walls in waiting. 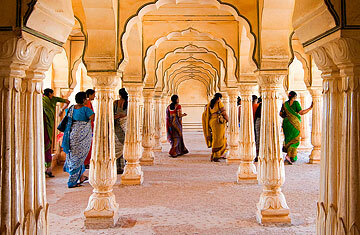 See rajasthan-tourism.org. In Jaipur, gilded former palaces and the floral-painted mansions known as havelis are not to gawk at  but to check into. The Rambagh Palace hotel, tajhotels.com, will make you feel like a raja for a day at a price, as will the newly restored Samode Palace (pictured above right) outside town, samode.com. Charming heritage hotels like Shahpura House, shahpurahouse.com, and the Kandwa Haveli, khandwahaveli.com, abound at more affordable prices. If that's not enough, the City Palace museum, msmsmuseum.com, boasts plenty of atmosphere. Jaipur has long been a center for gem cutting and the Old City's Johari (meaning jewel) Bazaar is a place to compare glittering rocks right on the street. For those who don't want to risk such purchases, the industrial suburb of Sanganer and the store of the leading local Anokhi clothes company as well as its Museum of Hand Printing are the best spots to obtain a safer and equally dazzling specialty: fabrics hand-stamped in a wonderful array of wood-carved patterns. See anokhi.com. Each summer, Jaipur explodes with red-capped turbans, painted elephants, tattooed brides and twirling mustaches in its celebration of Teej, a festival dedicated to the Hindu deity Parvati and her union with Shiva. Of more international flavor, winter's DSC Jaipur Literature Festival has grown into Asia's most prestigious celebration of local and international writing, with gatherings held over five nights beneath rainbow-streamed tents. Look out too for the growing Jaipur International Film Festival held in January. Start your explorations of the Old City with a walking tour arranged through the Jaipur Virasat heritage foundation, jaipurvirasatfoundation.org, which offers special access to temples and craftsmen's workshops. Don't miss the Palace of the Winds, Jaipur's multiwindowed ex-harem turned civic emblem. Or, skirting cows and camels and their droppings, you can get lost in bejeweled bangle bazaars or back alleys still organized by occupation in open-air guilds of brass workers, marble masons and plenty of confectioners. Few other spots provide such a concentrated blast of India in the pink.